“Arting” with friends for a good cause (the Corvallis Environmental Center) plus a complementary gourmet dinner in the midst of a gorgeous late summer garden… life just doesn’t get much better! I spent last Saturday afternoon happily absorbed painting bee boxes, pumpkins, and scarlet runner beans winding up stalks of ripening corn in the SAGE (Starker Arts Garden for Education) garden. Painting “en plein air” adds several increments of excitement to what is normally a quiet and solitary process: weather (in this case, sunny and warm, making the paint dry very quickly and making the light change every 15 minutes), bugs (bees and yellow jackets buzzing literally at my feet), and fascinating people. If I had stopped at phase 2, without all the white highlights and blue tints I added, I would have been happier than I am with the “finished” piece. Live and learn! The pumpkin below was a “post event” piece, created from my photo taken on the day of the event. This pumpkin was almost completely obscured by the leaves, which were ghostly with their coatings of powdery mildew. I had my doubts about when to call it “finished” as well, but in this case I’m glad I added the dark outlines and took the background all the way to black (click the thumbnail to enlarge). This entry was posted in Works and tagged art in the garden, Corvallis artists, Corvallis Environmental Center, gardening, harvest art, Kerry McFall, mixed media, multiple crops, Nature drawings, plein air watercolor, SAGE garden, sketch journal, Starker Arts Park, Willamette Valley on September 19, 2015 by Kerry McFall. The bike path from Oregon State University (Campus Way path) to Bald Hill runs through fields where the OSU Agriculture Department used to run sheep and cattle. It’s still quite bucolic, but it’s changing rapidly, some good, some not so good. Several of the old barns have given way to fancy new high-tech barns, and all but a few ragged old sheep have disappeared. I miss them. The barn I painted above is still standing, but I doubt for long, given it’s air of abandonment and open gates. This time of year, I always pick blackberries along the edges of the path, but no, not this year. The vines were scorched and thirsty, the few berries looked more like peppercorns. Two of the old pastures are now huge solar arrays, squatty faceless gray grids stretching on and on. I took photos, but never have drawn from them – bo-o-ring. U-u-gly. But ecologically good, right? Then again, I wonder what will happen when the thistles and ash tree seedlings grow so high that they shade the panels? That much weedkiller would be horrific. I read that the arrays are under scrutiny for alleged funny business with tax credits. Tsk. If I had known about them in advance, I might have asked about at least putting the panels up high enough for sheep to graze underneath them. But OSU doesn’t ask for community input. If you believe the banners hanging from light posts all over campus, it’s because Oregon belongs to the University. As opposed to the other way ’round. Tsk. The pastures closest to the fairgrounds hold llamas and some intimidating windowless barn-ish structures. There are bluebird nest boxes on many fence posts, and some good educational signage about wetlands down by the covered bridge. A couple more pastures are being restored as wetlands or oak savannah, which is the least they can do given the adjoining acreage south of this area that was wetlands last year and is apartment buildings this year. Not modest university housing, mind you, but luxury student condos… sorry, this is beginning to sound like a rant. After I photographed the barn, I stumbled upon the yellow jackets busily transforming half a mouse into a feast. I took a quick photo and hurried to the other side of the path – yellow jackets are always cranky in the early fall. (I wondered if the mouse fell out of the sky like a certain Herring…) Around the next corner, a wasp’s nest hung ominously from a seedling tree, looking for all the world like a mummy’s wrapped skull. I hurried across the covered bridge to try to beat the coming rains (for which we are all very grateful!) only to find turkey vultures hunched in the snag, watching me closely. Spooky. Change is always unsettling. The bike path is still a nice place for a stroll, and always provides glimpses of nature and food for thought. This one was not the usual bucolic experience, but I enjoyed the challenge of painting the scary critters and the barn after I got back to my dry dining room table. Once painted, it was interesting to examine the color palette that popped up when I saved the scary critters page – I would describe it as cranky. 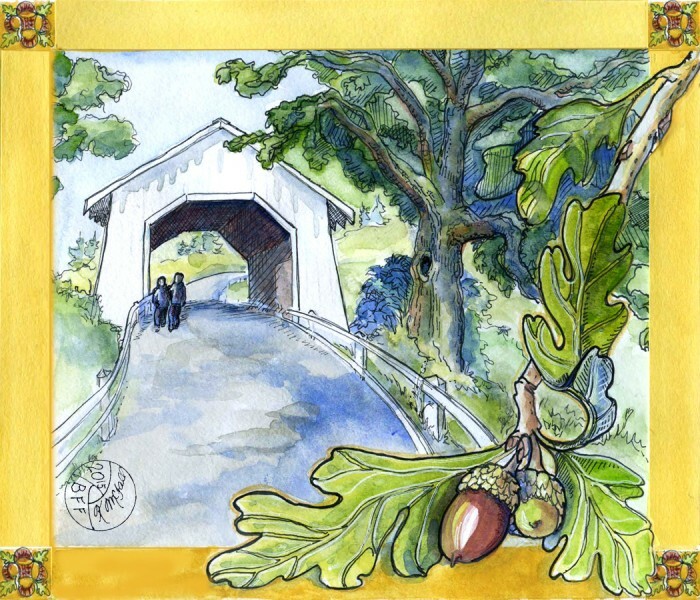 This entry was posted in Works and tagged Corvallis artists, Kerry McFall, mixed media, Nature drawings, OSU Campus Way bike path, OSU solar arrays, sketch journal, Willamette Valley, yellow jackets on September 3, 2015 by Kerry McFall. You can plan and plan, but sometimes you stumble on to a place by accident that simply demands that you stop and “be there”. Fryeburg, Maine, was just a dot on a blue highway map, on the way to Somewhere Else, until we actually got there. It was nearly lunchtime, and the driver was getting sleepy, so we pulled over at the farm stand and parked in the shade of an enormous old maple. There was a convenient picnic area on the lawn in front of the store, so I sketched the barn and store, while my husband went sound asleep in the car. I left the foreground blank, thinking I would find a peach or something inside to add later. Nope, no peaches in Maine in early August, BUT they did have baskets of intriguing little homemade treats called Whoopie Pies. The young clerk explained that they were made from, “… like, um, cupcake tops, with, um, you know, stuff in the middle…” Icing? Frosting? “Well, yeah, kinda but different. They’re a Maine Thing.” I have always thought that the whole point of a cupcake was the icing – in fact, when my kids were in school, I maintained that I could have re-used the same set of cupcakes for 10 years because kids only ever licked off the icing and threw away the actual cake. Maybe these Mainers were on to something! Taking off the saran wrap took some doing, but eventually we succeeded. Whoopie! It was like having a giant soft Oreo only with triple cream cheese filling, so you twisted it open, licked off the filling, and tossed the cake bits, which were stale anyway. I never did figure out the “pie” reference, sorta like Eskimo Pie I guess… but it was the perfect pre-lunch post-nap snack. The store had a lot of “Maine things” on the shelves; the ubiquitous maple syrup in little jugs that wouldn’t be allowed on the plane home in a carry-on bag, adorable knit baby socks and thick mittens that I have absolutely no need for, and much, much more. I finally opted to photograph some of the unique produce and paint it later – who ever heard of yellow-eyed peas, or canned fiddle-head ferns? The pickled cauliflower sounded yucky, to be honest, but whoever prepared it had the good sense to stick a red pepper in the jar for visual appeal, so it wasn’t as bad as it could have been… It took me three weeks to get around to it, but here are my slightly-wonky-perspective sketches from my photos. On the checkout counter at the farm stand I had seen a donation box labeled, “Save Our Spire”. A good idea, because we had noticed far too many little villages like this where the famous New England church spires were missing, leaving squatty little churches decaying by the roadside. We left the store and looped back to the main street, where I had spotted the 302 Smokehouse Tavern. It was a lively place, and a good lunch, and I was pleased to discover that the spire repairs were indeed underway across the parking lot! This entry was posted in Works and tagged Corvallis artists, drawings, Fryeburg Maine, Kerry McFall, Maine sketches, mixed media, sketch journal, sketches, travel sketches, Weston's Farm Stand, whoopie pie on August 26, 2015 by Kerry McFall. Too Hot – Vamanos to the Libraries! But most days this summer, it’s just too hot. So rather than fry, I put the kitty and her bowls out back under the fir tree, and pack up my Art Bag and go someplace cool. This last week I went to three libraries and a wine bar: OSU Valley Library is the largest and seems to be the one with the oldest art books; Corvallis downtown, by far the most populous; and LBCC, which was small but has an interesting assortment of art books. I didn’t want to drag my heavy old computer along, so I grabbed a random book from whatever was on the shelves, flipped to an interesting page, and pulled out my paints. Since school’s out and there weren’t any students around, nobody seemed to mind or even notice. The portrait of the long-necked lady was inspired by a painting in a book (I wrote the credits on the page). My sketching friends (mostly from Sketchbook Skool – it’s a great online community) and I have been discussing online the relative merits and various approaches to learning from the masters – this painting was shown in a black and white photograph, so it left lots of room for color interpretation. The Ansel Adams portrait was from a black and white photo taken by one of his friends – another opportunity for interpretation. After the LBCC library, we stopped to see the birdhouse I painted last spring for them – it really is a nice concept, with a little book inside where people passing by have written poems or drawn pictures. It was shady there in the quad, but not cool, so on to Albany. The wine bar was in a historic brick building that was lovely and air-conditioned to the “just right” mark on the thermometer. We chose a table that had a good angle on a mirror. Since I had my gear spread all over the table, it was difficult to finish unnoticed. Our server put the word out, so I had several admirers, and the owner wanted a photo when I finished – very kind and flattering folks. Maybe it will cool off and I’ll be able to focus this next week and finish the travel journal sketches from New England, but if it doesn’t, at least I know that I can always hole up in the libraries to beat the heat… I knew there was a good reason for all those taxes we pay! This entry was posted in Works and tagged Ansel Adams, daily sketch, fruit still ife, Kerry McFall, sketch, sketch journal, Sketchbook Skool, Sweet Red Bistro, travel sketches on August 22, 2015 by Kerry McFall. We recently drove with my mother to King Estate Vineyards, where I told them that what they really, really need is an Artist in Residence… what could be better than spending your afternoons painting and drinking wonderful wines? And I nominated myself, of course – now to persuade them! We enjoyed a gourmet dinner on the patio, looking over the flowers and hummingbirds out to the Willamette Valley and it’s ever-so-green-and-gold meadows and hillsides. I sketched and painted between bites and courses, concluding that hummingbirds are going to take some more practice. Lavender blossoms send up their sweet scent all around the restaurant and winery, planted in every possible spot and at the ends of the grape rows. As we left, I snapped a few photos of the shadows creeping from the big firs on the hill crest over the rows, undulating across the curved hillsides… you don’t see shadows this shape in most vineyard paintings! This entry was posted in Works and tagged Corvallis artists, daily sketch, Kerry McFall, King Estate Winery, Lavender Art, McFall, mixed media, Oregon, Oregon artists, Oregon wines, sketch journal, travel sketches, Vineyard Art, Watercolor and Wine, Willamette Valley, Willamette Valley wines, Wine on July 28, 2015 by Kerry McFall. When the temp reaches 97 degrees in the Willamette Valley, plus a pollen count that’s off-scale even for here, it’s time to skedaddle to the coast. Oregonians call it “the coast” because it’s not a beach… it’s a rocky stretch of sand scoured by cold wind and covered by clouds and fog. It’s just not a place where you stretch out with your paper umbrella in your drink and your floppy hat covering your face from the sun. Floppy hats must be anchored with elastic chin-bands, and drinks just make your hands colder. But we love it. You cross the center line of Highway 101 to turn onto the coast access road, and the temp plunges 40 degrees – no kidding! The brave little souls painted above were having a marvelous adventure because they don’t know any different… I hope their hot cocoa was waiting for them when they finally were dragged away! No trip to the coast is complete without a trip to Mo’s Chowder. We sat out of the wind and enjoyed garlic cheese bread with our bowls of buttery chowder, and I had a perfect view of the dock and the Tsunami-bait homes out on the jetty. We stayed a few nights, had quite an adventure in the casino, and were ready to come home to a much more comfortable stretch of temps in the 70’s… whew! Here comes summer! This entry was posted in Works and tagged Corvallis artists, daily sketch, drawings, escaping the heat, Kerry McFall, McFall, mixed media, Mo's Chowder, Nature drawings, Oregon, Oregon Coast, Proposal Rock, sketch journal, travel sketches, Willamette Valley on June 13, 2015 by Kerry McFall. BFF – More Than Just An Abbreviation! BFF = Best Friends Forever. Everybody knows that, right? Now it’s a special wine vintage and a wine cellar, and I was fortunate to be asked to design the first label! My friends Marcia Gilson and Robin Baker have partnered to begin BFF Cellars, and to make a series of wines, each with a label designed by a local artist. Here’s the art for the first label, I’ll post a photo of the actual bottle and label as soon as I can get my hands on it! This entry was posted in Works and tagged BFF, BFF Cellars, drawings, Kerry McFall, McFall, mixed media, Nature drawings, Oregon, Oregon wines, Philomath, sketch journal, travel sketches, Willamette Valley, Willamette Valley wines, wine label art, wine label designer, Wine Vault on May 19, 2015 by Kerry McFall.